HomeEducationCommonly Asked Questions Are All Sapphires Treated? 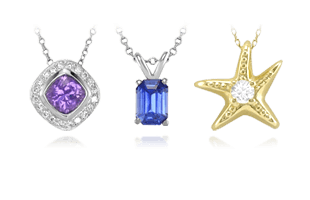 With so many choices for sapphires available, it is important to know exactly what may have been done to alter the gemstone. The majority of commercial grade sapphires have had some measure of treatment, the most common being heat treatment. Throughout history, it has been a common practice to treat sapphires in some way to enhance their color and clarity. 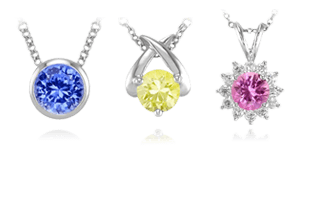 It is important to understand the ways in which sapphires may be treated so you can make an informed decision. What Does It Mean When A Gemstone Is Heated? Before and after examples of heated sandpaper quality sapphires. The oldest and most common sapphire enhancement is heat treatment, and the majority of the sapphires in the marketplace have been heat-treated or thermally enhanced in furnaces. 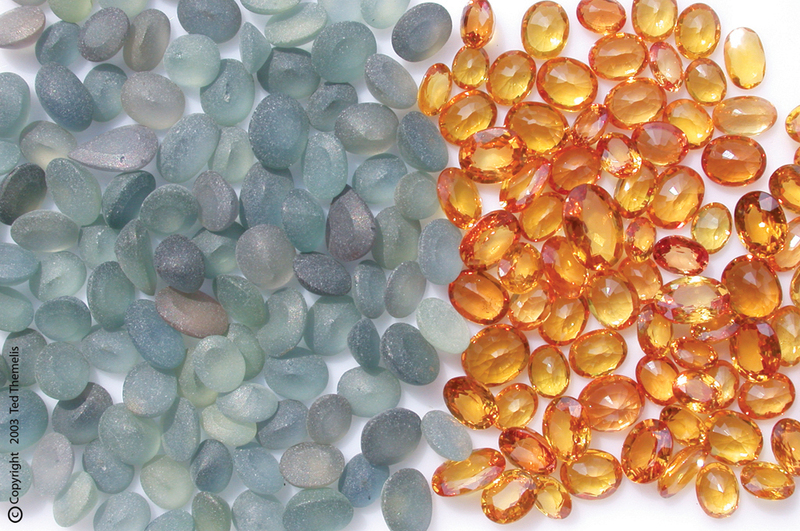 Heat treatment is used to improve a sapphire’s color, remove color zoning , and improve clarity. Some heat treatment procedures are relatively mild, involving temperatures of about 400 degrees Celsius for brief periods of time. 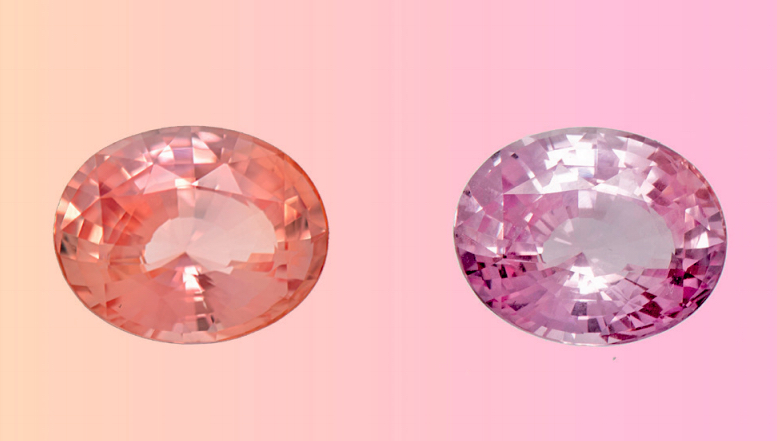 These are commonly used on pink sapphires from the mines of Madagascar and may also be applied to Madagascar’s coveted padparadscha sapphires. 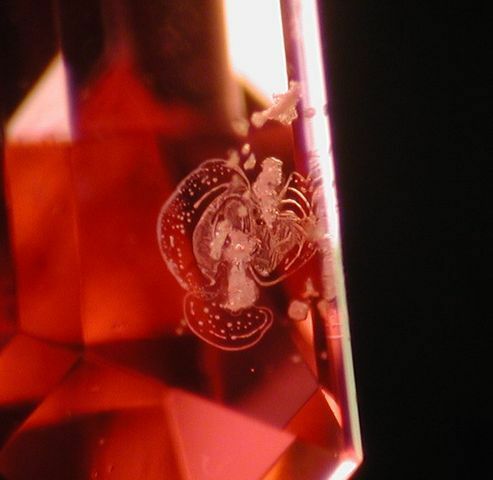 An unheated ruby with natural inclusions. Over the last couple of decades, high temperatures in excess of 1700 degrees Celsius has been applied to sapphires, which improve their clarity by dissolving silk as it improves color. The results can be dramatic, transforming pale stones into ones with lively, saturated colors. Knowledgeable gemologists will be able to discern whether a sapphire has been subjected to this kind of extreme heating. When corundum is heated to between 1200-1600 degrees Celsius, star sapphires can be created or improved, however, since the demand for transparent rough has increased in recent decades, treatments to create asterism are not frequently encountered. While some consumers have learned to accept heat-treated stones, even without disclosure, connoisseurs prize those rare stones that show fine color and clarity without this enhancement. What Does It Mean When A Stone Is Filled? Cavities and fractures within the stone can compromise a sapphire’s clarity. Today, many gems have been heated and infused with a chemical flux in order to improve their clarity, luster and durability. At high temperatures, the flux melts and penetrates surface reaching fractures or cavities in the stone. Diagram showing flux healing in fracture zones. When cooled, the flux may either solidify into a glassy mass (fracture filling) or facilitate corundum re-crystallization within the fissure (flux healing). There is considerable debate in the industry about how much of the clarity enhancing effect is due to filling versus healing, but in either case, the treatment can make low value, poor quality sapphires more marketable. 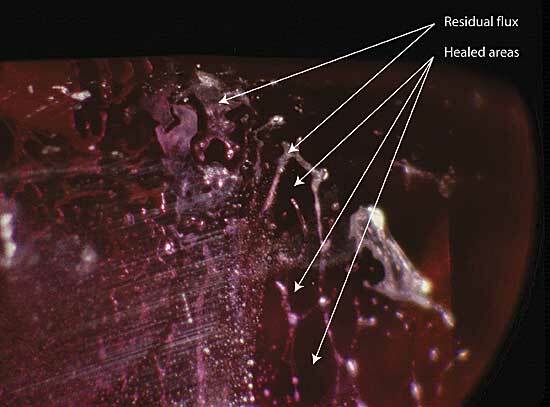 Magnification of a flux-healed fracture within a heat-treated ruby. Flux enhancements have also earned a bad reputation because in extreme circumstances, poor quality gemstones are literally held together by the glassy filler. While this is not a widespread practice in the sapphire trade, this treatment is widely reported in the ruby trade. 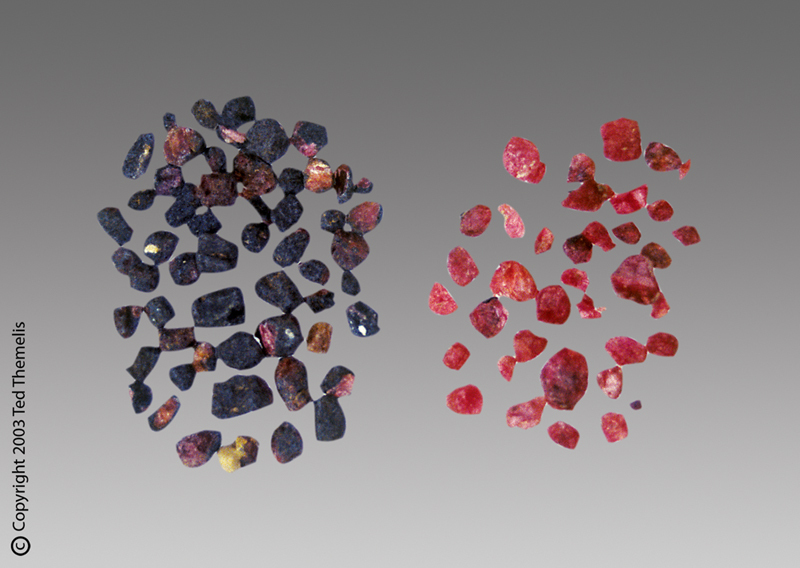 These glass or fracture-filled rubies can also be extremely fragile. Many are destroyed during the jewelry repair process, routine cleaning, or re-polishing. How Does Beryllium Diffusion Change Sapphires? Diffusion processes, including both titanium and beryllium treatments, are relatively new techniques that have generated a great deal of controversy in the marketplace. Although diffusion procedures have several variations, sapphires are typically heated to very near their melting point in the presence of color-inducing elements, which penetrate or diffuse into the stones. Before and after examples of beryllium treated sapphires. In the case of titanium diffusion, a layer of strong color is created near the surface of a poorly colored stone. Since the layer of color is surface level only, the original weak color of the stone can be revealed if it is chipped, nicked or re-polished. Newer diffusion techniques use the element beryllium, which has a smaller atomic structure than titanium, so it is capable of penetrating deeper into the sapphire. While titanium colors pale sapphires blue, beryllium is most often used to induce orange or golden hues. During the 1990s, the treatment was hard to detect, since the coloring agent penetrated deeply and uniformly into the stone. As a result, many of these treated sapphires were mistaken for natural padparadschas. Diffusion treatment is often the last resort when heat treatments have failed to enhance the color of a stone. 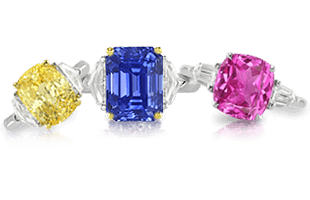 Sapphires that have obtained their color from diffusion treatments have little intrinsic value. Reputable dealers will identify diffusion-treated sapphires and offer them at prices well below those of natural, untreated stones. Radiation And Sapphires, How Are They Related? 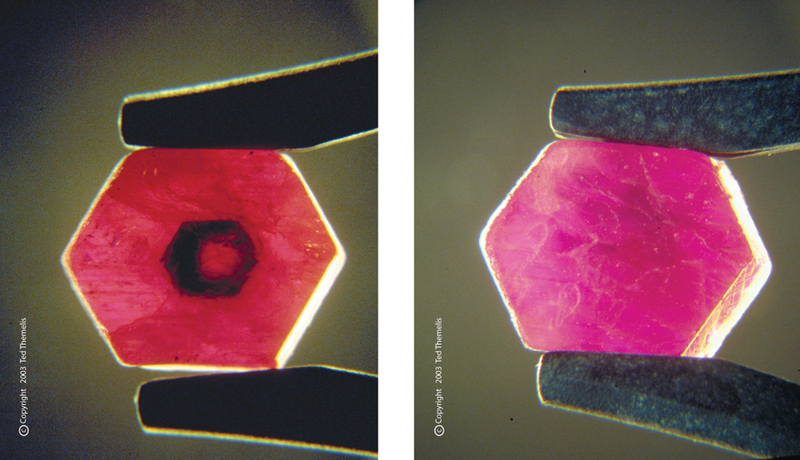 An unstable color sapphire showing a shift from a padparadscha-like color to a pink color with a fade test. Photo credit: SSEF. Pale yellow, faint brown, and grayish sapphires are sometimes exposed to controlled radiation in order to induce an attractive, saturated golden yellow to orange-yellow color. While these stones are safe to wear, their color is not usually stable and will fade quickly under bright light or if heat is applied. 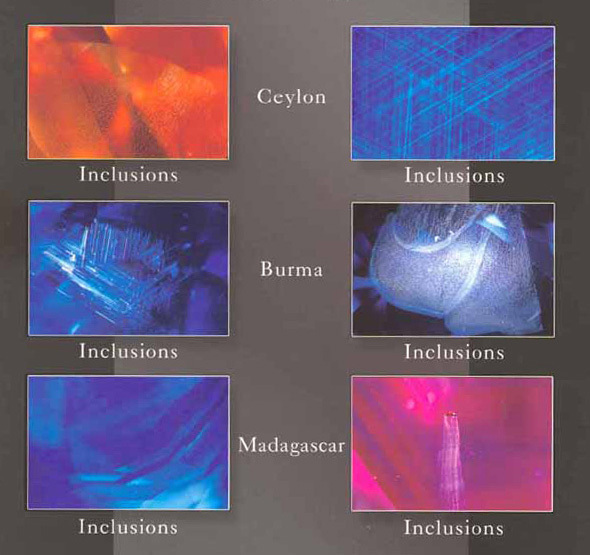 Irradiation is hard to detect through laboratory testing, but gemologists and gem dealers will often subject suspect stones to a “fade test” by exposing them to intense light for a time and evaluating any change in color. A yellow or orange sapphire that fades in sunlight or with ordinary levels of heat is of limited value. 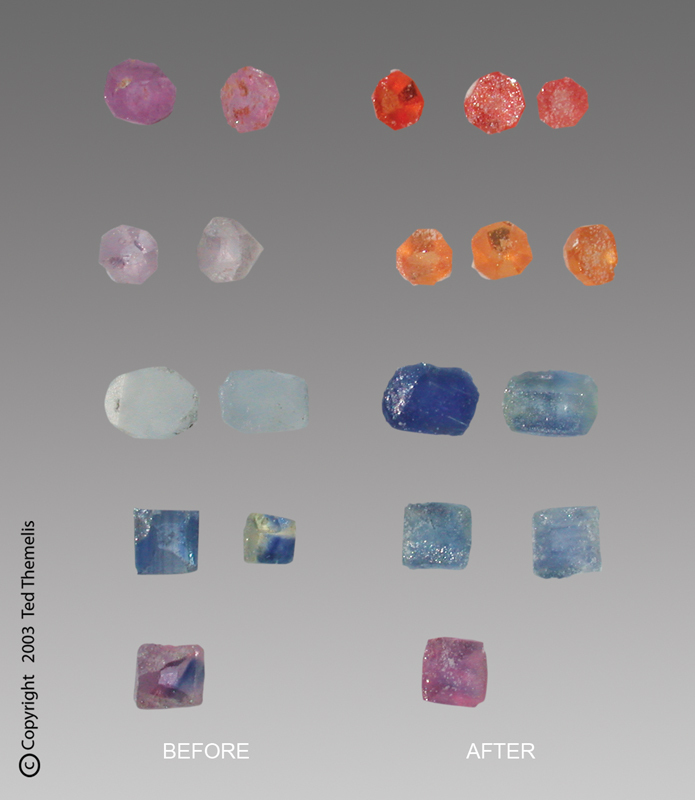 In this section we show the “before and after” samples of treated sapphires. This section is provided for those who must “see to believe.” These pictures are NOT digitally altered or misrepresented in any way. They have been supplied by scientific and reputable laboratories, individuals, and companies that are held in high regard within the trade. None of these photos have been taken by our company. They have all been supplied by third party independent professional scientists and laboratories. Once considered completely useless, this corundum (sapphire) has been treated in a sophisticated heating process that radically changes the color and clarity so that it becomes a mix of pink sapphires and rubies. These stones are now considered of saleable quality. Here is “sandpaper quality” sapphire that is treated to produce commercially valuable stones. Unlimited quantities of “sandpaper quality” sapphire exist that can be used for treating. These stones are then cut and put into jewelry for sale. This process proves the unlimited creation of treated sapphires that are not rare at all. 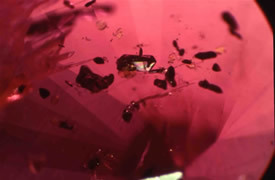 This purplish-black sapphire from Burma has been transformed into a commercially usable pink sapphire after a flux additive is put in the heating process. Traditional heating of sapphires typically takes 2-3 days and requires extreme temperatures and conditions to achieve the desired results that will make the sapphire more “commercial” quality. Here are all natural untreated sapphire inclusions photographed at various magnifications. 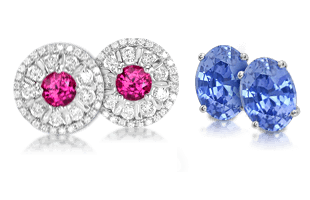 These specific types of inclusions show that these sapphires have not been treated by heating. Unique types of inclusions in sapphires can also suggest where a specific sapphire was mined in the world. Once a trained individual has studied many types of sapphires and inclusions they can make educated assumptions on the origin of where the sapphire originated. The study of inclusions in sapphires is a sure way to detect if a sapphire has been treated. Heating sapphires at extreme temperatures change the internal characteristics so much that it is quite easy for a trained gemologist to determine if the sapphire has been heated. This diagram illustrates how natural untreated inclusions in a sapphire (left) would appear and how ruptured inclusions in a heated sapphire (right) would change the appearance. With all of these types of treatments and the skill involved with detecting them, it is common that laboratories may not agree on a sapphire grading. We cover this issue next in Why Do Labs Not Agree On Sapphire Gradings? Commonly Asked Questions How Do You Best Establish the Value of a Sapphire? Commonly Asked Questions Why Do Labs Not Agree On Sapphire Gradings?